The manufacture of salt in Hingham commenced at Broad Cove around 1812. Buoyed by the rapid growth of Hingham’s fishing industry in the early years of the 19th century, several salt works were built, both at the easterly end of the harbor, near the steamboat landing, and on the salt meadows at Broad Cove. Salt manufacture, “one of the old industries of Hingham,” was the subject of a paper presented to the Hingham Historical Society at its January 24, 1916 meeting, by Orin Brewster Sears, “a son of the proprietor of the [salt] works.” The salt works owned and operated by Orin Brewster Sears’ father, also named Orin Sears, were built in the salt meadow along Otis Street, accessed by Fearing Road. They were the last salt works to operate in Hingham. In his paper, “The Old Salt Works,” published in 1916 as “Hingham Historical Society Publication No. 1,” Sears described the method of extracting sea salt by solar evaporation. Salt water was pumped from the harbor into two long rows of vats around 200 feet long, called the “water rooms,” which ran up from the harbor at the westerly end of the salt meadow. 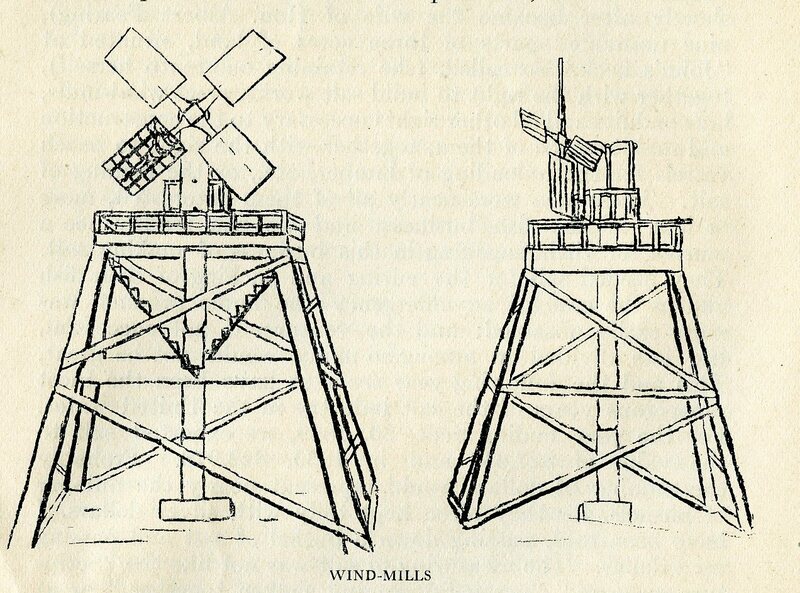 The pumps used to fill the water rooms were powered by a pair of windmills. The water sat in the vats, evaporating, until it began to deposit lime, at which point it was drawn, through a system of hollow logs, to the “pickle rooms.” There, as evaporation continued, lime and other unwanted constituents of sea brine were separated from the salt and water and salt crystals began to form. The liquid would then be drawn, again through hollow logs, to another set of vats in the “salt rooms.” Here, as the salt crystals increased in size, they dropped to the bottom of the vats and were raked together, drained, and carried to the “salt house” to dry. The entire process took around three weeks. The Sears family was instrumental in the development of New England’s salt industry. Pre-revolutionary colonists imported salt from England. The war-time embargo created a crisis on Cape Cod, where salted fish was a staple food and primary export. Captain John Sears of Dennis is credited with having invented the method of sea salt extraction by solar extraction described above. Well suited to New England’s climate, it was adopted across the Cape as our domestic salt industry grew, aided by tariffs imposed by the young United States government. It was also the system used in Hingham. 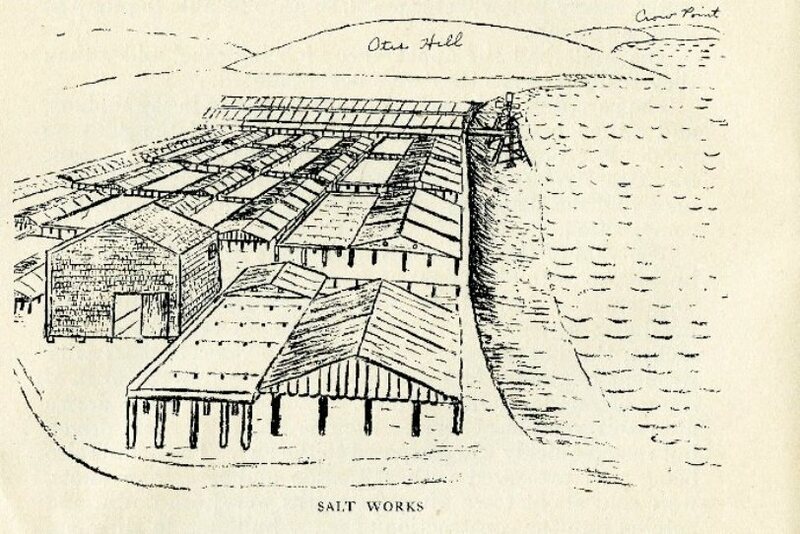 Orin Sears moved to Hingham from Dennis in 1846, motivated by “the desire to keep his boys from going to sea,” then “the only lucrative business on the Cape.” He purchased the salt works described in the Historical Society paper, although the heyday of the local salt industry had already passed. Between the mid-1830s and the mid-1850s, as the result of the decline of its fisheries and the development of alternate domestic sources of salt, Hingham’s salt production declined from over 20,000 bushels a year to fewer than 2,000. It may seem strange to some of us in this day of development, with mines of rock salt, salt lakes, and salt springs almost everywhere, that our fathers should have been obliged to procure their supply from the ocean; no less so that with our country filled to overflowing with petroleum, they should have been obliged to brave the dangers of the whale fishery, for oil for illuminating purposes. Those of us who have lived to watch the transition from tallow candle to the electric light, from the lumbering stage coach over rough roads to the automobile on the modern oiled stone boulevards or swifter steam express trains, from the messenger to the wireless telegraph, have reason to thank God that we live in the twentieth century.